Although my parents intended to save every entertaining letter from Grandma, it was inevitable they’d lose some along the way. Really, the number of letters that did survive is remarkable considering our five relocations during those three letter-writing decades. Despite the lost letters, we have managed to keep some of their stories alive. Grandma’s most notorious lost letter was one she wrote in the early 1960s. The letter arrived in the middle of the summer, and it told about the death of a local farmer. He was a widower and, other than his faithful dog, he lived alone on his farm. While working out in the field one hot summer day, the elderly farmer had a heart attack and died instantly. Several days passed before anyone missed him. Finally, some neighbors stopped by his farmhouse. No one answered the door, but as the neighbors were leaving, they noticed in the field the farmer’s dog lying next to what they suspected was the farmer’s body. They walked out into the field to investigate but when they got close, the large dog sprang up, growling and baring its teeth to the approaching group. It wasn’t about to allow anyone near its fallen master. After several failed attempts to distract or scare the dog away, the neighbors decided it was a job for the marshal. When Grandpa arrived, he quickly determined the only solution was to tranquilize the dog. A local veterinarian supplied a dose of sedative that Grandpa added to a handful of raw hamburger. After tossing the juiced ball of meat out to the dog, Grandpa and his posse waited under a shade tree near the farmhouse. A few minutes after wolfing down the medicated meatball, the dog collapsed into a deep sleep, and the men began the grim duty of removing the farmer’s body. This is where the letter got interesting. Although Grandma wasn’t there, she painted a vivid written portrait of the scene based only on Grandpa’s account. After lying in the blistering 90-degree sun for several days, the farmer’s body was in a severe state of decomposition. Grandma didn’t hold back: She wrote about the swarm of flies and other winged insects the men had to fight through to get to the remains. She told about how maggots and other creepy-crawlies had quickly inhabited the bloated corpse, particularly in its eyes and gaping mouth. She described how they shoveled the farmer part by part into a body bag. And she brought to powerful life the overwhelming stench of rotting flesh. Mom read this letter to some family friends shortly after it arrived. At the maggots-in-the-eyes-and-mouth point, our friend’s 10-year-old daughter began dry heaving. At the stench-of-rotting-flesh point, she jumped up, ran into the bathroom … and garped in the pot. Most writers try to elicit emotional responses from their readers. If causing someone to puke counts as an emotional response, Grandma could have been Hemingway in an alternate bizarro universe. Several years ago, I put out a call to all relatives to scour their homes in the hopes of discovering some of Grandma’s lost letters. Nothing significant turned up, but my mom and Aunt Mae did have interesting replies with letters of their own. Both told about an incident that happened when they were in their late teens/early 20s. 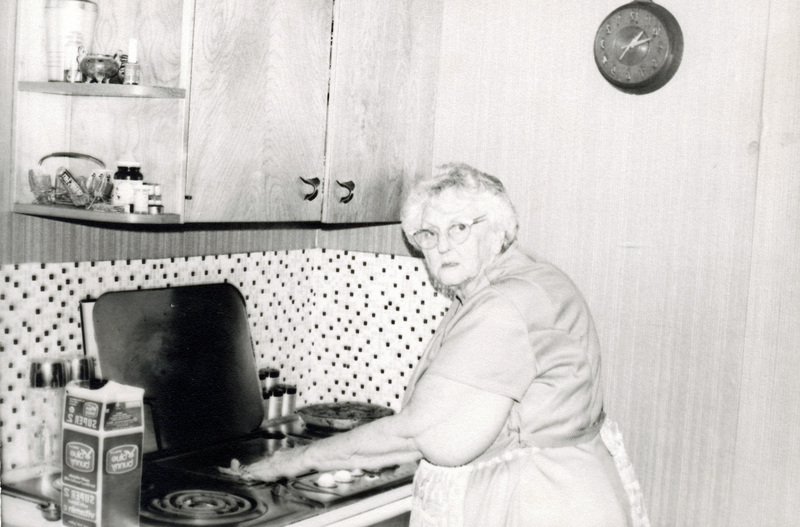 Although Mom and Aunt Mae wrote to me independently, they told the same story nearly word for word. That might seem uncanny, but for anyone who knows Mae and Maudie, it’s no surprise. Born 16 months apart, they’ve often been mistaken for twins – not so much for their physical resemblance, but for the way they communicate on a level no one dares ascend (or descend) to. 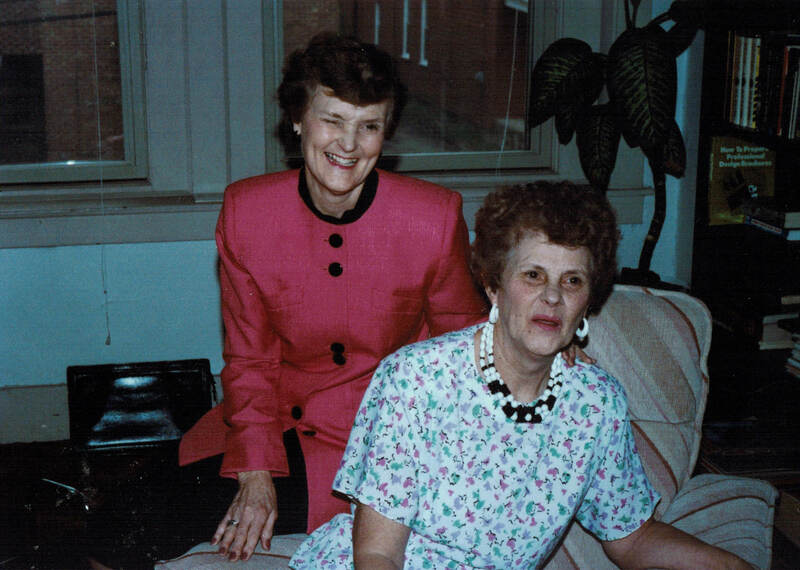 To the listener, Mom and Aunt Mae’s verbal exchanges probably sound like the conversational equivalents of the blind leading the blind, but somehow they magically understand each other. It’s as if they share one brain … which means they each use only half at a time … which seems about right. We were shopping in Valparaiso with Mom and our nephew Steve, who was about 5 years old at the time. Everyone knows Mom never wore underpants unless she was going out of town. We were walking down a busy street, and just as we were in front of a big store window, Mom felt something falling. Lo’ and behold, it was her underpants! The elastic band broke and they fell to the ground right in front of a crowded department store. We kept walking as if we didn’t know her, but little Stevie stayed with her. She stepped out of her undies, and Stevie picked them up and carried them as they went into an office building’s stairwell to fix them. We were in the doghouse for a long time after that. For the record, I didn’t know about Grandma’s underwear-wearing policy, which is fine – I think it’s best I didn’t.